I have many Design Diary posts for you—looks at homes I’ve written about for Boston print publications, but have yet to feature. 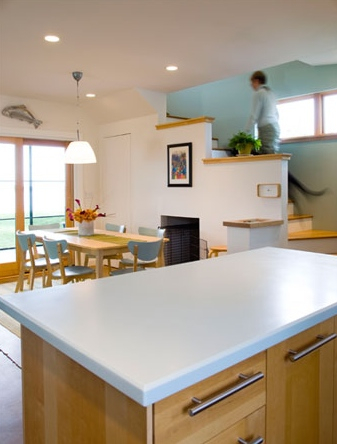 This home, designed by Carrie Shores of Larson Shores Architects is an eco-friendly project we featured (on the cover) of the Boston Globe Magazine in December 2009. The article, called “Living A Vision” was photographed by James R. Salomon. I flew up to Rockland, Maine to see the house, interview homeowner Rhonda Nordstrom, and isit her spa, which I blogged about here: Beauty Break: Rheal Day Spa. 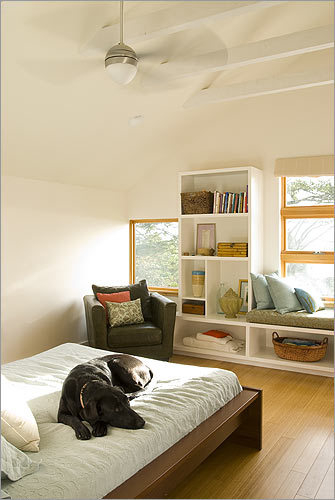 But before you click over, scroll through to see Rhonda Nordstrom’s green home in coastal Maine. The two-story house, which replaced a small cottage that had no heat or running water in winter, is 1,400-square-feet, and sited on two-tenths of an acre with a very New England view. They didn’t cut down any trees, but had to do a lot of excavation and grading. The house is sited so passersby can enjoy the view of the harbor. 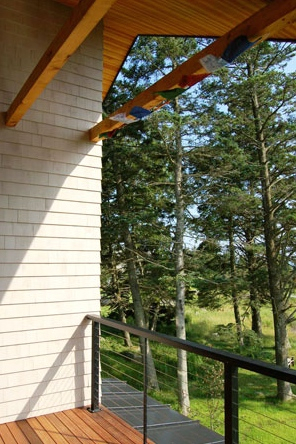 The exterior is shingled, to blend with the Maine vernacular, though the trim is painted black. 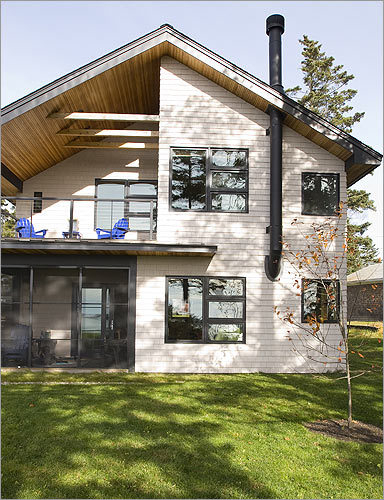 The arrangement of windows and the overhang of the back porch lend a modern feel. They left the metal chimney pipe exposed, to echo the sensibility of the working waterfront. 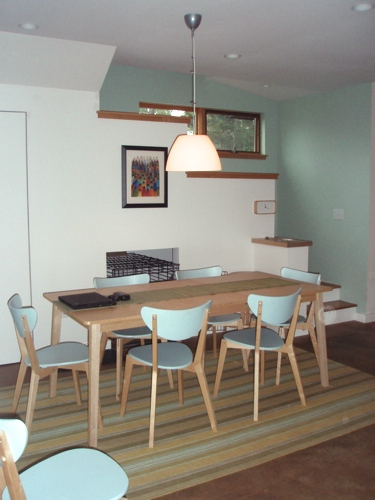 Eco-friendly finishes are mixed with a contemporary and Scandinavian aesthetic. (Rhonda’s husband’s parents are from Sweden.) 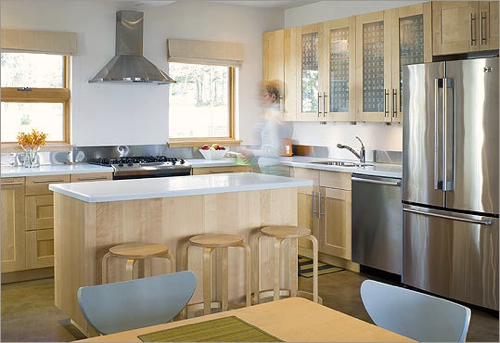 The kitchen cabinetry is Ikea, which fit the look and budget. There’s no basement, just a concrete slab. Instead of covering over it, Shores incorporated it into the design. The first floor is stained, polished concrete, with radiant heat. The countertop is Corian. Beyond the eating area, sliders open into the grassy yard, which leads to the water. Take a close look—under the artwork, there’s a niche for the dog crate. Table and chairs from Ikea. 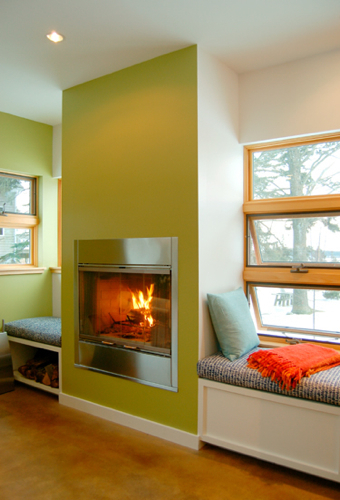 The raised fireplace is easy to access. Rhonda insisted on window seats. 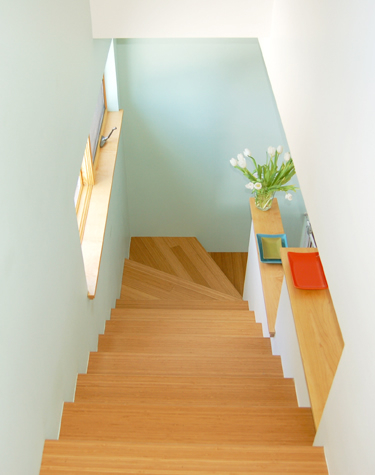 The stairs and second floor are done in bamboo, also with radiant heat. 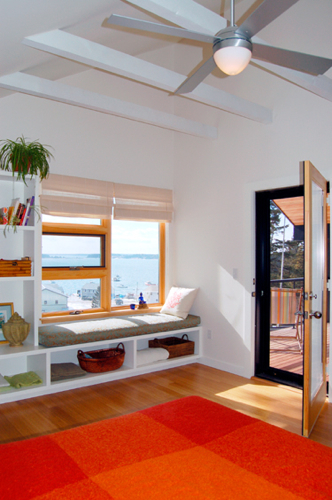 Built-ins make the most of the space. Rhonda got a window seat here too. A fan keeps the air moving. Notice the cathedral ceilings. The bathroom floor is lined with ipe leftover from the deck. 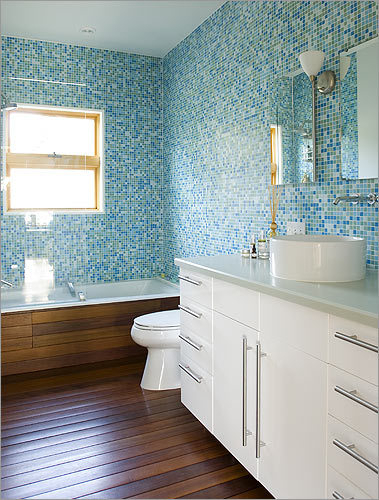 The tiles are recycled glass mosaics. 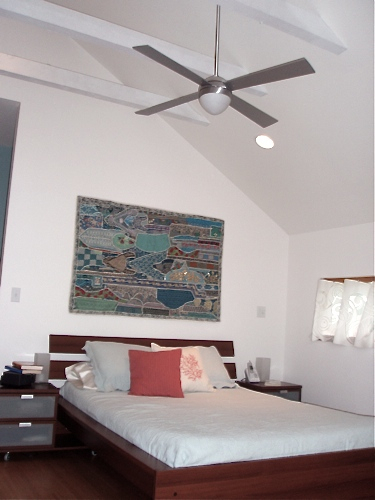 The bedroom opens onto the back porch. You can see the boats out the window. The railing is industrial steel and wire. 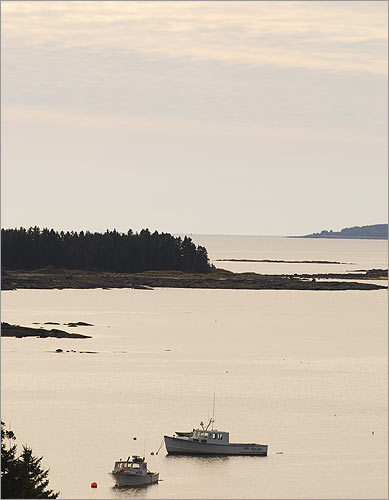 is one of the largest lobster shipping ports in the country.